Drones and other unmanned technologies can cost-effectively collect weather data in harsh or remote environments and contribute to better weather and climate models, according to a new study from CIRES and NOAA researchers. Unmanned aircraft and instrument-bearing tethered balloons are helping fill in critical data gaps over difficult-to-sample surfaces in the Arctic, including newly forming sea ice and partially frozen tundra. "We're showing that we have the ability to deploy unmanned aircraft and tethered balloon systems routinely in a very harsh environment for targeted field campaigns. We're also supporting development efforts to make these technologies available to the broader scientific community," said Gijs de Boer, a CIRES researcher working in the NOAA Earth System Research Laboratory and lead author of the paper, published June 29 in the Bulletin of the American Meteorological Society. Communities, businesses, and governments around the world need accurate and timely weather and climate forecasts for planning and safety. One key to improving forecast models is obtaining additional data, especially lacking in remote locations such as the Arctic. This research, a collaboration between CIRES and NOAA scientists, along with United States Department of Energy (DOE) and university partners, was designed to investigate whether drones and other unmanned technologies can complement and enhance more conventional ways of gathering atmospheric data. In the new study, the researchers find that unmanned aircraft and tethered balloon systems—collectively known as unmanned aircraft systems or UASs—can help fill data gaps and are well-suited for routine flights in the Arctic. And because of the work done by DOE's Atmospheric Radiation Measurement (ARM) user facility, in partnership with de Boer and his colleagues to develop these state-of-the-art unmanned technologies, ARM is now accepting proposals from atmospheric scientists to deploy UASs at their research sites. Since 1997, the ARM user facility has collected measurements of clouds, aerosols, atmospheric state, and radiation at their North Slope of Alaska observatory near Utqiaġvik (formerly Barrow). Additional measurements have been taken at Atqasuk (approximately 60 miles inland from Utqia?vik) and Oliktok Point (another coastal site, 165 miles to the southwest of Utqiaġvik). These observatory-based measurements have helped scientists better understand the Arctic natural system. When ground-based, stationary instruments take measurements, those observations are limited to that location or a scanning instrument's field of view. Unmanned aircraft or tethered balloons can take measurements over much larger areas. 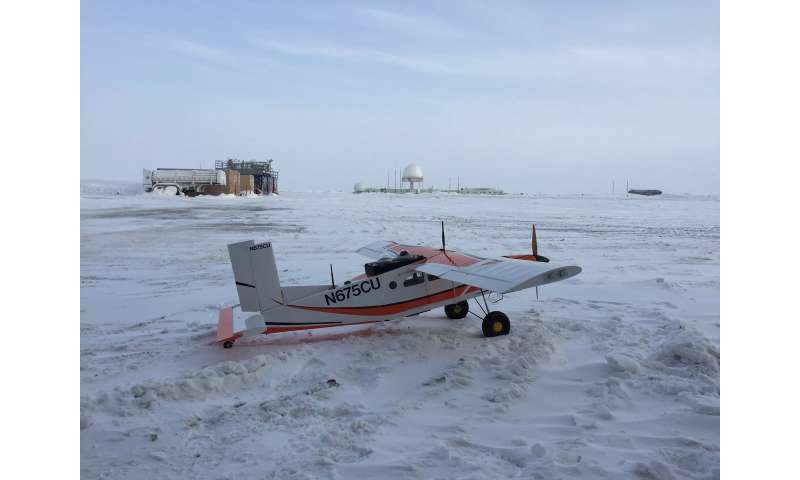 Recognizing the potential of UAS observations, the DOE fostered acceleration of scientific UAS field deployments in the Arctic in starting in 2015. "The surface around ARM's North Slope sites is highly heterogeneous, so the information that these technologies can provide is extremely valuable to understand what impact the varied surface is having on atmospheric properties," said James Mather, ARM technical director. In a series of campaigns, de Boer and his colleagues along with ARM staff members flew various unmanned aircraft, and ARM staff from Sandia National Laboratory launched tethered balloons, demonstrating increasingly more advanced and miniaturized measurement capabilities—including NOAA's Printed Optical Particle Spectrometer, or POPS—while expanding operations to harsher Arctic conditions. Together, these UASs provide detailed profiles of atmospheric properties—including thermodynamics, winds, radiation, aerosols, cloud microphysics—that provide a more comprehensive understanding of the Arctic's lower atmosphere. Because they're taken in situ, or at the location of interest, atmospheric measurements taken with unmanned aircraft systems can better represent local conditions, and feeding those observations into weather or climate models makes the models more accurate. "With balloons and unmanned aircraft, we get a different perspective," said de Boer. "We can cover larger areas and get a distribution, for example, of temperature variability around a site. With UASs we can sample across a model's grid box instead of at a single point, and that's important for model development." In addition to his Arctic research, de Boer is the organizer of this year's annual gathering of an international community using UAS for atmospheric research known as ISARRA, short for the International Society for Atmospheric Research using Remotely piloted Aircraft. Following a week-long conference at the University of Colorado in Boulder, over a hundred scientists, engineers and aircraft pilots will regroup for a week of science flights in southern Colorado's San Luis Valley. De Boer, along with CIRES, NOAA, and ARM colleagues, will head back to Alaska's North Slope later this summer for another field campaign. As part of the World Meteorological Organization's and the World Climate Research Programme's Year of Polar Prediction, the researchers will use unmanned aircraft and tethered balloons to observe and model the Arctic lower atmosphere at the DOE Oliktok Point site. They're also teaming up with the University of Alaska Fairbanks and partners to take UAS measurements over the Arctic Ocean to better understand how wind influences ocean mixing.